There are things about your parents that you never knew you never knew. Like I never knew my mum was lactose intolerant until I was a teen and I never knew my dad's waistline until I wanted to buy him a pair of khakis from Sweden. Last month, we were over at my mum's place when she suddenly said: "Do you know that your dad has a lifelong aspiration? A dream item he has always wanted?" Intrigued, I asked her what it was. The answer was one that I had never imagined - "A massage chair". Deep down, I was resolute that I would save up and make that dream come true one day. Just not now because, well, I need diapers and formula more urgently. So, by fate or coincidence, when OSIM offered to send the uAngel for a review, I was more than ecstatic and I knew my parents would be too. The OSIM uAngel is a dual-function stylish armchair which transforms into a full-body massage chair at the touch of a button. 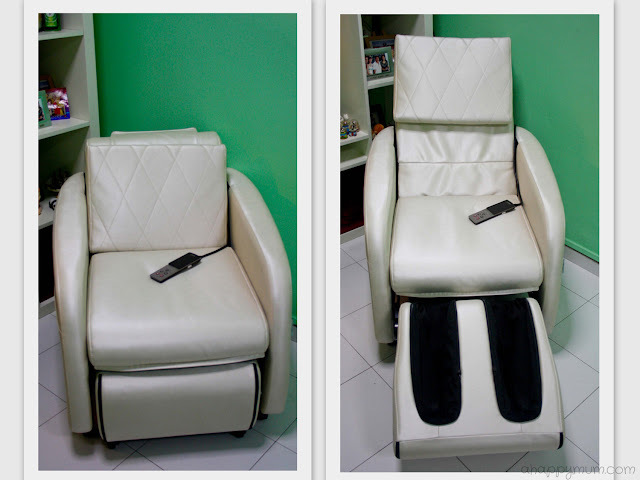 I was initially worried about the space needed for a massage chair because stereotypically, it would be bulky and take up lots of space, which is what our 3-room HDB flat cannot afford. To my surprise, as the world's first sofa-transzformer chair, the uAngel is not only sleek but slender as well, making it a perfect fit for cosy homes with limited space. It doubles up as a living room sofa with an innovative backrest and leg massager unit that can be fully retracted to provide 34% more living space, which makes it attractive as a space saver. With this versatility, we can indulge in multiple lifestyle enjoyment when using it as an armchair. From the young to the old, the uAngel caters to all of our needs in a chair, not to mention that it is comfortable and comes in an alluring metallic brushed upholstery. The OSIM uAngel offers a suite of professionally designed massage programs including 1) Lumbar, 2) De-stress, 3) Relax, 4) Energise and 5) Neck and shoulders. From pampering to invigorating, low to high intensity, small to wide coverage, it allows you to stimulate or relax your body as you desire. For instance, my mum prefers to use the Neck and Shoulders after completing the household chores while my Dad can use the De-stress to help unwind mentally after a hard day of work. If you wish to, you can also personalise your session and derive pleasure from a selection of kneading, rolling, tapping or dual massages. In addition, the shoulder position can be adjusted according to height so as to ensure a customised and accurate massage. For those who fancy hyper-power foot massage, you will be thrilled to know that uAngel comes with intense squeeze-and-knead action, roller reflexology and vibration to help ease those leg muscles. They never fail to make my mum squeal every single time! 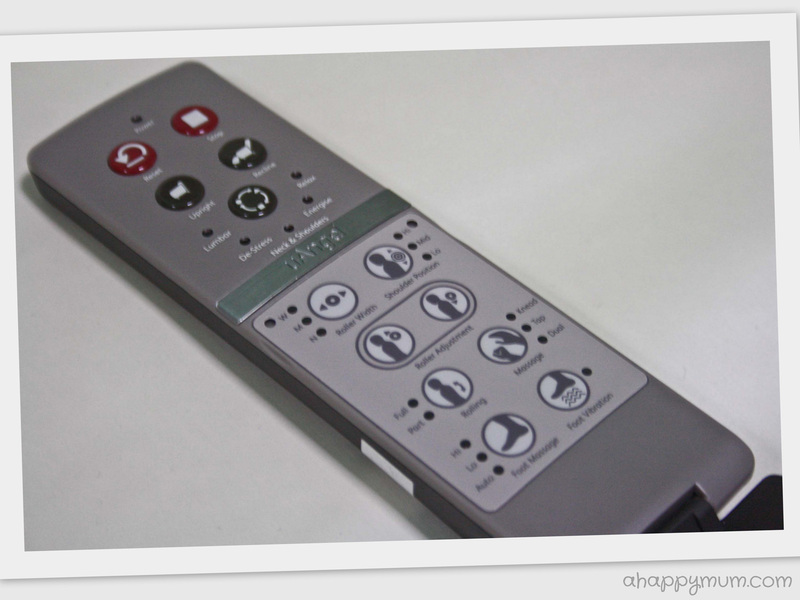 Just how small is the OSIM uAngel? In armchair mode, it measures 70cm (width) by 86cm (depth) and when fully reclined, it measures 70cm (width) by 143cm (depth). Yes, compact is definitely the word to describe it. How long does it take to transform from sofa to massage chair? There are five colours you can choose from to match different home interiors, namely Stellar Red, Celestial White, Mystique Grey, Cosmic Blue and Enchanting Green. Seeing the relaxed and contented looks on my parents, it just warms my heart to know that they are at the phase of life where they can sit back and savour every moment. If you are considering what to buy this coming Mother's Day or Father's Day and have some cash to spare, I guess the OSIM uAngel is a perfect choice. As for me, when I have a rare moment of peace, I like to let myself be embraced by the wonders of this massage angel in disguise too. Yes, I'm a mum after all. 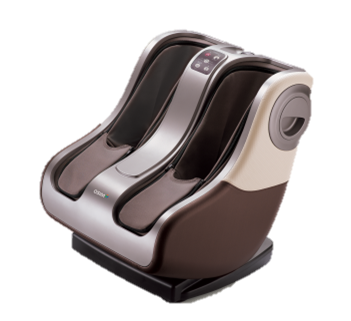 The OSIM uAngel retails at a special introductory price of S$1,988 (usual price S$2,688) and is now available at all OSIM outlets, road shows and online at www.OSIM.com. 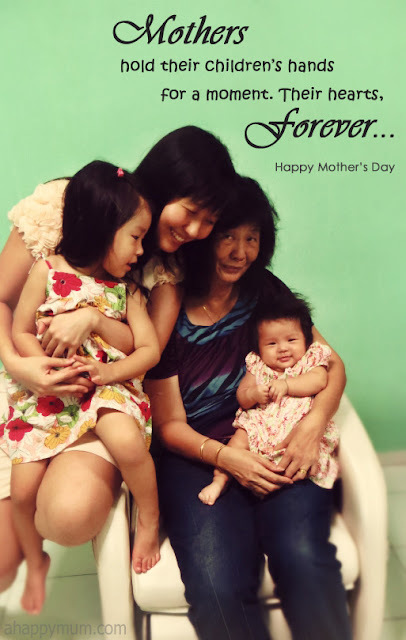 This Mother's Day, reward those aching legs and WIN for yourself or your mum an OSIM uPhoria - The world's first Tui-Na leg massager worth S$798! 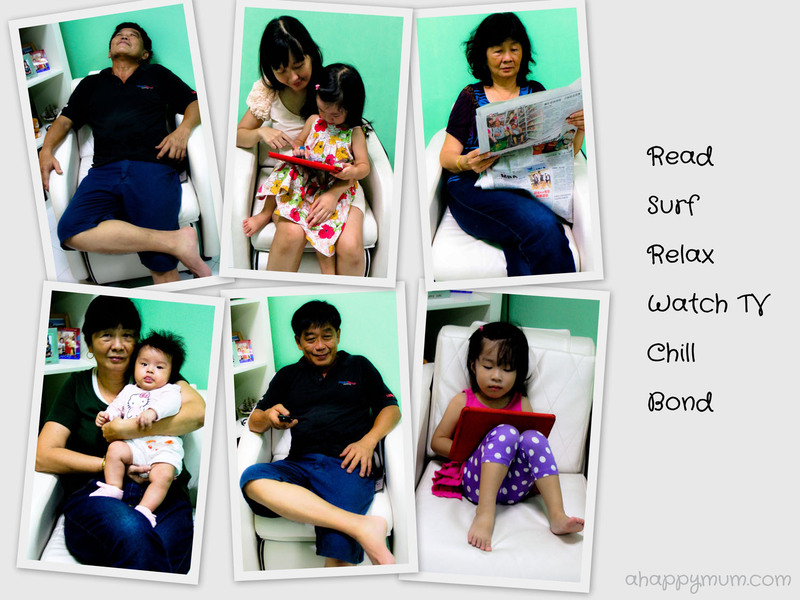 2) Under the bloggers' contest, vote for A Happy Mum's picture. Get your family members to vote too and you will have a higher chance of winning! *The uPhoria will be given away to one of the winning blogger's voters. While anyone can vote, please note that the giveaway is applicable to residents in Singapore only. P/S: Mother's Day is going to be pretty awesome this year with all the angels in my life. Here's wishing a Happy Mother's Day in advance to all mums out there and stay lovely always! Disclosure: I received the OSIM uAngel for a trial period in writing this review. No monetary compensation was received and all opinions are my own. hehe I hope u win!! This is a great review. I support u! That is a cool massage chair. Or can always use a vending massage chair. Hi, may I know how is the UAngel after almost a year? Any comment? How's the quality and functioning? Hi Kereen, regretted we only got the uAngel for a trial period of two months so I am not in the position to comment. =) It was good while it lasted for that period! What a great story! So cool that you were able to review it and give it to your father. How surprised was he? 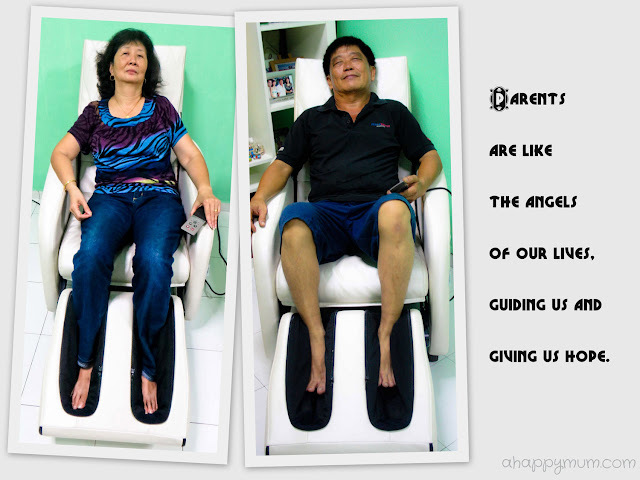 Than you so much for sharing this really informative writing about massage chairs. True to say- I really didn't know so much about massage chair before reading this. Keep sharing this kind of interesting topics.